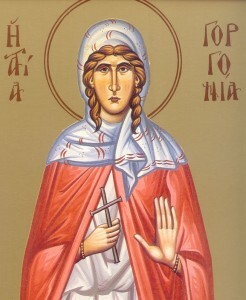 Saint Gorgonia, the elder sister of Saint Gregory the Theologian (25 Jan.), was the daughter of Saint Gregory Nazianzen the Elder (1 Jan.) and of Saint Nonna (5 Aug.). Growing up at Nazianzus and possessed of the same zeal for the Faith as her parents, she always regarded the heavenly Jerusalem as her true homeland, and her authentic nobility as deriving from the image of God. This she sought from her youth to enhance through the adornment of the virtues, especially of chastity, in which she excelled. She was mar­ried to Alypius, a citizen of Iconium, by whom she had three daughters. Showing in her marriage a virginal ardour for God alone, she drew her husband to share with her in the contests of virtue. She guarded her eyes from every unseemly sight, closed her ears to idle talk, and listened attentively only to what was godly and edifying. She had transformed unbecoming laughter to a peaceful smile that lit up her countenance. She knew, as none other, how to control her tongue and how to season her words with salt so as to utter nothing but the praises of God. Unlike many other women, she did not trifle her time away, neither did she set herself against the God-given natural order by making elegance of dress her chief care, nor by marring her face, the image of God, with rouge and powder. A soul made beautiful by the holy virtues was her sole adornment, and all the colour she applied to her face, pale from fasting, was the rosy hue of modesty. Her wisdom and knowledge of all that pertains to godliness made her the very model of a Christian wife. Her relatives, fellow-citizens, and numerous strangers relied on her as a counsellor who would indicate the Christian reponse in any of the knotty prob­lems which they encountered while living in the world. She was foremost in her care for the churches of God, and in her respect for the priests and clergy, to whom the doors of her house were always open. Neither had she her equal in almsgiving nor in com­passion for all the afflicted, so that you could well say that, like righteous Job, she was: eyes to the blind, feet to the lame, a mother to the orphans (Job. 29:15ff.). A dreadful accident befell her one day, when her carriage over­turned and she was dragged for some distance along the ground. Such was her modesty that she would not allow the doctor to see her swollen body, but she placed all her hope in God who healed her by a miracle. On another occasion, when she was suffering from an illness for which the doctors could do nothing, she got up at night and went to the church, where she threw herself to the ground before the altar and reminded God of the miracles He had wrought in times past for His servants’ sake. Like the woman in the Gospel who bathed the Lord’s feet in her tears, so did she sprinkle the holy altar, and thus found healing. Having received Holy Baptism—belatedly, as the custom then was—there was nothing more to keep her in this life, and her night-long prayer was to join Christ without further delay. The day of her death was revealed to her during one of these vigils, and there remained the Baptism of her husband to complete her la­bours as a disciple of Christ and emulator of the Apostles. She fell ill on the day appointed and, gathering her relations and friends around her bed, she conveyed to them her final teaching on eter­nal life. Thereupon she departed to join the festal choir of Saints, murmuring in a scarcely audible voice the Psalm verse: Gathered in unity, I will lie down and sleep in peace (Ps. 4:9).